Coming home to a flooded kitchen can be an unpleasant surprise as you immediately start thinking about how much this problem will cost to fix. While the feeling can be frustrating, there are actually a number of steps you can take to eliminate extra time and costs when it comes to making the repairs and restoring the water damage. However, if you are able to make the repairs yourself, it is still important to have the area inspected by a professional to ensure that the problem does not return in the future. Shut off the water. The shutoff valve is usually located in the basement or outside by the water meter. If you cannot find it or are not able to turn it off, call your local plumber for help. Protect furniture and furnishings. If you have any rugs, remove them from the floor and hang them to dry to prevent mold growth. Pin up any furniture skirts and prop up any cushions and/or pillows. If possible, remove any tables and chairs that have contact with the water to prevent the moisture from traveling upwards and damaging the wood. If you are not able to move them, place a piece of aluminum foil between the legs and floor. Turn off electricity if necessary. If you smell gas or see sparks, turn off the main circuit breaker. If you notice both, don’t hesitate to get out of the house and call the fire department right away. Remove all excess water. If you have a shop vac that is able to remove water, this would be the most efficient tool. Otherwise, a mop and a bucket will be handy. Increase air flow. After the excess water has been removed, it is likely that the building materials and furnishings are still wet. To dry them out, turn on the air conditioner or dehumidifier. If weather conditions are dry, open the exterior windows to allow for additional air to circulate the property. However, if sewage water has seeped into the air conditioning unit, do not use it. Open drawers and cabinets. Moisture can easily accumulate within these smaller areas; be sure that they are all open to allow dry air to flow throughout the space. Avoid damaged electrical items. If any kitchen appliances, such as the toaster, blender, microwave, oven, etc. have been damaged by the water, do not use them. 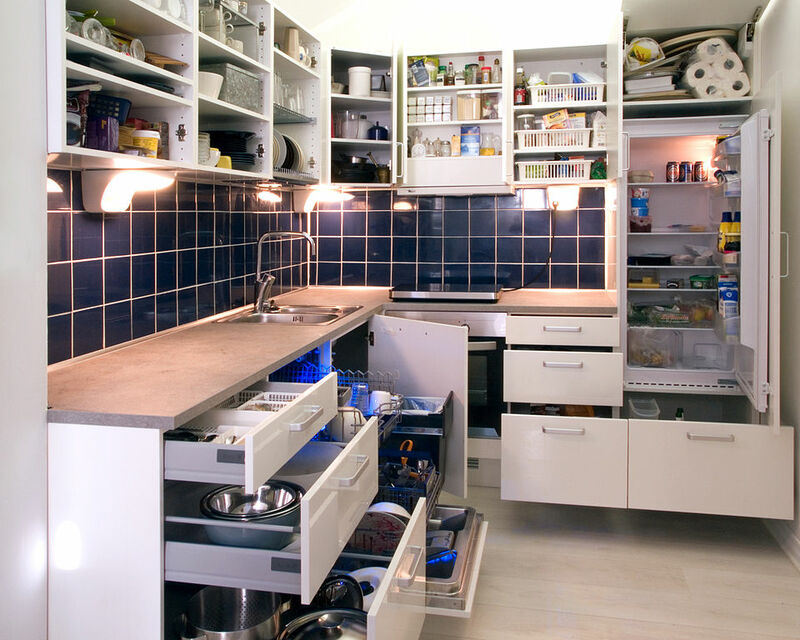 Have them inspected by a professional to determine if they are safe to reuse. Do not lay down magazines or newspaper. Although paper is quick to retain water, the ink will quickly bleed onto the floor and cause a bigger mess. Dry off wet furniture. If any upholstery has been damaged from the water, wipe them down thoroughly. But be careful when drying off wood furniture; this type of material becomes severely weakened after having contact with water. 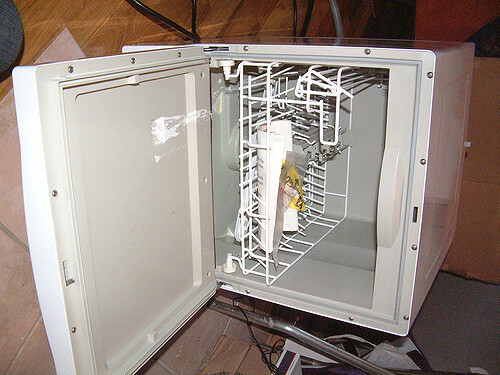 The majority of kitchen floods are caused by a malfunctioning dishwasher. Especially if the problem is not treated right away, such as finding it after returning from a vacation, the repair costs can put a major dent in a bank account. Unfortunately, there are a number of reasons why it can experience problems, one being the buildup of food along the seal when the baskets are pulled out. Over time, leaks will occur on the bottom of the unit around the door hinges. If you have noticed this buildup, you can easily remove it with a sponge, a few drops of detergent, and a little vinegar. But if it has already grown into a bigger problem, you can take these steps to address a flooded kitchen. Shut off the circuit breaker. The most important step you can take is not to panic because time will be a significant factor when determining the costs. If you can, shut off the appliance, or turn off the circuit breaker. Remove debris. One of the many reasons that may be causing the appliance to flood is that the drain tube is blocked. Try to remove as much debris as you can and see if it works properly afterwards. If not, you will need to fix or repair the water hose that runs from the unit to the kitchen sink. Repair or replace hose. This part may not be as difficult as you think. To find the hose, remove as much excess water from the appliance as you can. Once you find it, disconnect it and put it under the faucet of your kitchen sink, allowing water to run through it. If you notice any leaks or that the water doesn’t flow easily, you may have to replace it. Install new or repaired hose. After you have bought a new hose or have repaired your old one, install it in the dishwasher again and turn the water to see if the problem persists. If so, call your local plumber. After experiencing a flooded kitchen caused by your dishwasher, you may want to take these steps to avoid this problem from reoccurring in the future. Check detergent brand and amount used. When using too much detergent, it can create blockages within the hose. Load dishes properly. When loading dishes improperly, they can hold excess water and spill through the door vent, causing the appliance to malfunction. Inspect the door gasket. If you notice any signs of water seeping through the door edges, this is the first sign that the door gasket needs to be replaced. Otherwise, the door just needs to be tightened. While there are a number of steps you can take to prevent floods, it is impossible to prevent them altogether, due to the significant number of possible sources. But it is important to take action as soon as you notice any signs of leaks to prevent the problem from getting worse. 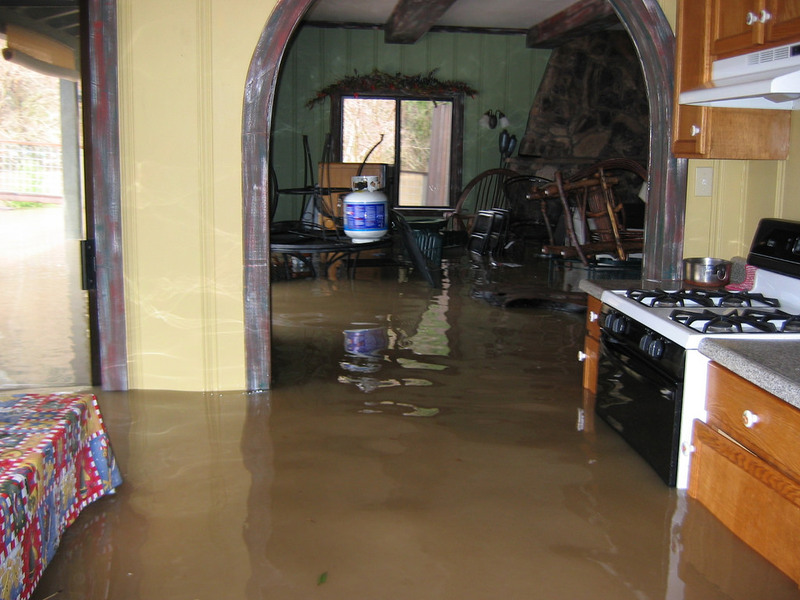 In the event that you do encounter a flood in your kitchen or any other area on your property, don’t hesitate to call a water damage restoration professional. One of the most highly trained and experienced companies you should consider is ServiceMaster. They not only consider each case an emergency, but arrive immediately after receiving your first call with advanced equipment and products to remove all excess water and dry out the affected areas. Finally, they will ensure that the problem does not return in the future, identifying and securing each potential risk. Next story What Are the Levels of Mold Damage? Previous story Does Homeowner’s Insurance Cover Water Damage from Rain?